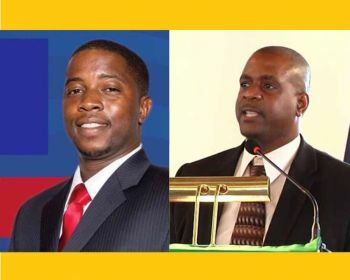 ROAD TOWN, Tortola, VI – Hon Melvin M. Turnbull (R2) aka ‘Mitch,’ of the new Progressive Virgin Islands Movement (PVIM), lashed out at Opposition Leader and Virgin Islands Party (VIP) Chairman, Hon Andrew A. Fahie (R1) for claiming that he asked to join the VIP. Hon Fahie, who made the revelations during a press conference at the studios of the Caribbean Broadcast Network (CBN), on Friday, December 14, 2018, said the former National Democratic Party (NDP 1) member—now with the PVIM—Hon Turnbull, expressed interest to join the VIP in December of 2017. “In December 2017 we started a series of meetings with Honourable Turnbull who expressed interest to join the Virgin Islands Party at that time,” the Opposition Leader told the press. “However, I always made it clear that whatever you are going to do, you have to do it correctly because although we didn’t have members at that time, we wanted to make sure that we rebuilt the party on solid principles and foundations,” Hon Fahie said. “At one time he [Hon Turnbull] did request the Deputy Premier [post], but I can’t give what I don’t have,” Mr Fahie told the media. Hon Turnbull, now a key member in the PVIM headed by Party Chairman, Hon Ronnie W. Skelton (AL), did not take the accusations lightly and fired back in a Facebook live video on the same Friday, calling the Opposition Leader a ‘liar’. “I believe private meetings should be just that and it was not something that I intended to go public with, but the member [Hon Fahie] did so and it is my view that I would correct and address those issues,” he said. “Hon Fahie approached me, and continued to approach me to tell me that I need to jump ship and join with him and the Virgin Islands Party,” Mr Turnbull said in the video. He then provided context, that the offer was made when he Turnbull, spoke out against Premier and Minister of Finance Dr The Honourable D. Orlando Smith (AL). “That is the truth, [and] the statements made by Hon Fahie… is complete and utter lies,” Hon Turnbull said. Mitch is telling the truth, come on fahie shame on you. Play the tape, it was he and his father who came. Play the tape! You all need to stop and lead from the front. Hon. Facie show the receipts I know you have them. Hon. Mitch as a man of God you are becoming more of a disappointment. Mitch is power hungry. That's a shame. All this crap is not moving our county in a better direction. The BVI has become the laughing stock of Caribbean. And this have nothing to do with Irma. And the media’s curry picking of which blogs to post is adding fuel to the nonsense knowing it will increase their ratings. They are not interested in facts or what is the truth. Listen the people want solutions so we can choose people best fit to lead us regardless of which party they support. Like someone said, whether you asked or was asked, the bottom line is that discussions were held about joining the VIP. If it were me, they would have had to make me a good offer too. He should have just ignored Andrew because his response changes nothing. Who believed Andrew before still believe him and vice versa. So what has changed? Absolutely nothing. Mitch yo to lie! It's not even election day yet and you done know you loose. You lost most of your supporters when you choose to go with PVIM. Yo done know 2nd district people especially the JVD crew not pleased with the choice you made, after we told you to go with the VIP, you could still come on here and talk **** bout how you never wanted to join the VIP. You just confirm why you can't get my vote. YO TO DARM LIE! Repent and ask God to forgive! Disappointed Much!